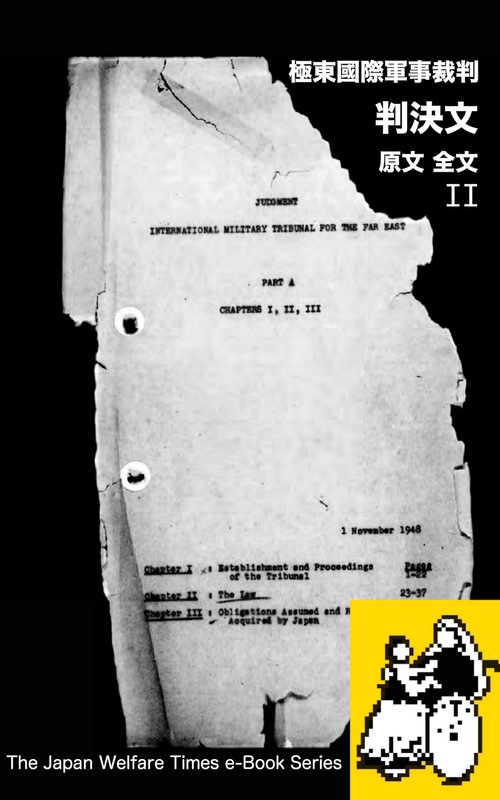 ・"President Roosevelt, Generalissimo Chiang Kai-shek and Prime Minister Churchill, together with their respective military and diplomatic advisers, have completed a conference in North Africa.（1943 Cairo Declaration）"
・"Moscow Meeting Of Council Of Foreign"
・"Charter of the International Military Tribunal Constitution of the International Military Tribunal"
・"ESTABLISHMENT OF AN INTERNATIONAL MILITARY TRIBUNAL FOR THE FAR EAST"
・'Convention (IV) respecting the Laws and Customs of War on Land and its annex: Regulations concerning the Laws and Customs of War on Land. The Hague, 18 October 1907"
・"Convention relative to the Treatment of Prisoners of War. Geneva, 27 July 1929"
・"JUDGMENT INTERNATIONAL MILITARY TRIBUNAL FOR THE FAR EAST INDICTMENT"
・"TREATY OF MUTUAL COOPERATION AND SECURITY BETWEEN JAPAN AND THE UNITED STATES OF AMERICA (Japan-U.S. Security Treaty)"
・"AGREEMENT REGARDING THE STATUS OF UNITED STATES ARMED FORCES IN JAPAN"
・"AGREED MINUTES TO THE AGREEMENT UNDER ARTICLE VI OF THE TREATY OF MUTUAL COOPERATION AND SECURITY BETWEEN JAPAN AND THE UNITED STATES OF AMERICA, REGARDING FACILITIES AND AREAS AND THE STATUS OF UNITED STATES ARMED FORCES IN JAPAN"
do not consciously embark upon the road to insanity. Every page was torn, full of scratches, bended, broken, and did not keep the original shape. Many people must have touched it. Someone turned the pages with their eyes shining while laughing. Someone copied the document with tears. It looks like Japan itself. As if, it's were the world itself. In the history of modern Japan, the most important sentences. Many Japanese intellectuals stop thinking in front of this sentences. They try to find a person to hit a feeling of vomiting. Was it absolutely necessary for us to kill people? Was it absolutely necessary to invade other countries?